Our staff are friendly and experienced and the centre is open all year. The fabulous 2.5 -3 hour ride to Omey Island across beautiful Omey Beach is an experience not to be missed. We also offer shorter rides of 90 minutes, one hour and 30 minutes for small children. 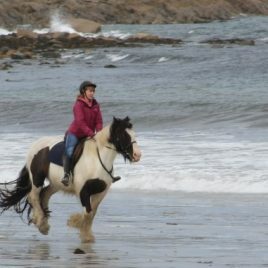 For trekking we have a wide range of Connemara ponies, Irish cobs and Irish Sport Horses to suit all ages and standards.